In the cell, this reaction is broken down into smaller steps. The energy that is released powers the reactions in the cell. Reactions involving electron transfers are known as oxidation-reduction (redox) reactions. The breathing technique the bacteria utilizes involves excreting and pumping out electrons. In other words, these types of microbes produce electricity in order to breath. Scientists and Engineers are working on ways to utilize these microbes for power production to run fuel cells and purify sewage water (sludge), etc. The challenge is to understand the microbial electrical pathways, mechanism, and properties. It is reported that these microbes are much smaller than mammalian cells and very difficult to grow under laboratory conditions. Derek R Lovley, “The microbe electric: conversion of organic matter to electricity,” Current Opinion in Biotechnology, Volume 19, Issue 6, 2008, Pages 564-571, https://doi.org/10.1016/j.copbio.2008.10.005. Bruce E. Logan, John M. Regan, “Electricity-producing bacterial communities in microbial fuel cells,” Trends in Microbiology, Volume 14, Issue 12, 2006, Pages 512-518, https://doi.org/10.1016/j.tim.2006.10.003. This short list of publications show research being conducted as recent as 2015 related to a rapid high throughput screen technique for electricity producing bacteria; a 2008 paper that describes the mechanism for electricity producing bacteria; a method for connecting the bacteria to electrodes using C-type cytochromes as wires; and in 2006 the application of the bacteria to fuel cells. Laboratories have been studying this phenomenon and how to harness its power for over 12 years based on the quick and short survey of the literature. In conducting Scientific research, we are presented with a problem, propose a hypothesis based upon the basic principles of chemistry and physics, run experiments, observation of the test results, interpretation, and then application of the newly found knowledge. In this research we can see the extensive amount of work that is going into the this area of research. These things teach us an important lesson that may be applied directly to our lives as God’s children. It is easy to see how much effort goes into understanding the science behind the microbial production of electricity as illustrated in these publications over the years because of the great benefit that would be achieved for humanity. The question is how much effort goes into studying and learning about God’s Word and its practical application to our lives? How much benefit do you think this would achieve for humanity of everyone took God’s Word seriously? Studying God’s Word is for the purpose of knowing God, knowing His Messiah Yeshua, and applying God’s word to our lives, and this is very important endeavor. From the Scientific method, we whould take the following approach to studying God’s Word. One of the noblest pursuits we can put our hand to in life is to know and understand God better. The way this is accomplished is to carefully look at the book He has given us which communicates who He is and what His plan is for all of mankind. The Apostle Peter wrote, “Knowing this first of all, that no prophecy of Scripture comes from someone’s own interpretation. For no prophecy was ever produced by the will of man, but men spoke from God as they were carried along by the Holy Spirit.” (2 Peter 1:20-21) Peter describes the Bible as being directly inspired by God. The Bible is not an easy book. Most people believe the bible is an easy book by reason they do not study this literary work and only believe they get enough of it by going to church and listening to a sermon once a week. The Bible is actually written by God in an ancient time through people of different languages and cultures than our own, whose immediate audiences were different from us in many ways. Therefore, much effort “must” go into studying what God wants for us in our lives! This book describes how God created this world, how He is working in the lives of men, and how He influences this world. The Bible is the work of a divine author and is such an immense topic, it is difficult to fully comprehend by simply hearing a sermon once a week. This is why there is a need to study and wrestle with God’s words for its understanding and application. The Word of God is challenging, however sin is also powerfully at work in the lives of men which lead people to twist the words of God for their own purposes. Consider the theologies that we are being taught to day, hyper-grace, replacement theology, the Torah does not apply any more, etc. This sort of manipulation is confusing and distracting from God’s people and keep God’s people from fully grasping the truth of God’s Word. The Word of God challenges us, and interaction with the text is intense if we are taking the Scriptures seriously. Because the Bible is God’s Word, studying it is the only way to know God better. It is through the words of Scripture that we come to know not only the nature and attributes of God, but also His plan in history, His sovereignty, His providence, His love and more. In God’s plan for mankind, he brought His Messiah (Yeshua) who came and laid his life down on our behalf for the forgiveness of sins. When we believe this is what God has done, He sends His Spirit to dwell in our hearts (in our midst) and empowers us to overcome the world, changes our heart and attitude towards others such that we we love one another. 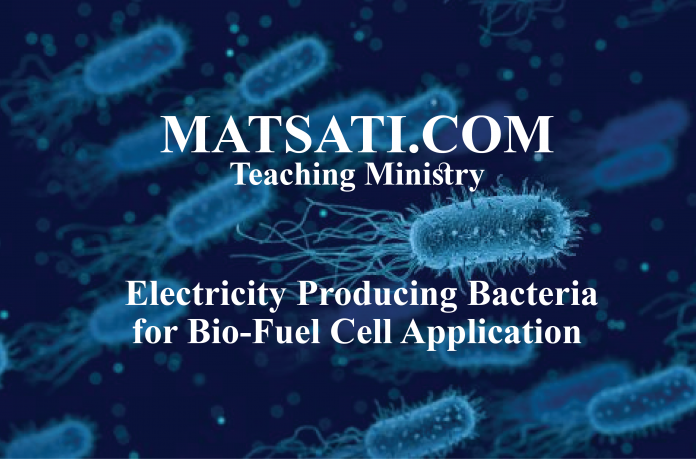 This has world changing properties, just as we see in the Research on “Electricity Producing Bacteria for Bio-Fuel Cell Application.” If everyone took God’s Word seriously, believed in His Son, and loved one another, there would be world changing effects! This is why more effort must go into our relationship with God and His Son, Yeshua the Messiah!